​This is typically seen as rats gradually loosing strength in the back legs, first expressing itself with a mild shuffling or stumbling gait and a tendency to walk flat footed. This then gradually develops until the rat has little to no use of its back legs. You will also gradually see a loss of muscle tone around the hindquarters and back, making a their flanks look quite pinched and often feeling bony to the touch, especially along the spine. Often their tail will become very floppy too starting from the tip and progressing backwards. HLD generally occurs earlier in males than females, this could be linked to their increased size and likelihood of being overweight (and so more stressors on the body), their tendency to be lazier than girls or possibly the fact they are more prone to kidney problems than girls. • The first is sometimes known as hind leg paralysis or nerve degeneration, it is thought to be caused by the nerves within the spine beginning to fail and wear out, this causes them to function less and less effectively at sending messages to the legs and tail, meaning they slowly but surely stop working. This is exacerbated by the gradual weakening meaning the rat doesn't use the muscle as much and so it loses more tone and triggers the nerves less, which means they work a little less effectively and so on. It is an inevitable part of old age if a rat lives to this point, however there is a lot you can do to slow the failure down and make it occur later in life. As well as feeding (which is discussed later) keeping them fit and active for as long as possible makes a real difference. • The second (which is rarer) is caused by arthritis and does mimic hind leg paralysis to some extent, not least because they often occur alongside each other. In this case it is caused by the wearing out of the rats joint, particularly the soft part of the joint which cushions movement and shock, this is then made worse by swelling around the damaged area which can be quite painful. Identifying it as opposed to HLD is useful as whilst it is good practice to feed in case they have it, rats can benefit from anti-inflammatory medication which can impact on other conditions so is only worth trying if you believe this might be present. In identifying it look for symptoms of pain whilst moving, a lack of mobility in certain joints or pain when the joint is gently manipulated. The rats may also look very stiff when they walk, rather than the floppiness associated with paralysis. If this is the case trying an anti-inflammatory to see if it improves mobility should indicate if it is or not. If it does improve then the minimum dose required to keep the rat pain free alongside a good diet should make a big difference. It’s worth noting that an anti-inflammatory will make kidney failure worse, so care should be taken to only use it if the rat benefits from it. • The third type of HLD is thought to be caused by kidney failure, there are no scientific studies specifically to confirm that this link exists, however in practice a lot of owners do see a link. It is likely that as both are very common in old age and so coincidentally occur together in some cases. The main potential link I have been able to find is the tendency for kidney failure and degeneration to lead to a calcium deficiency (due to a decreased ability to absorb it), this can cause calcium to be leached from the bones which in some cases can accumulate as crystals in the joints mimicking arthritis. There is also the link that with kidney failure rats are less able to digest protein, this means they can’t effectively build muscle as well. The first places to loose muscle tone when a protein deficiency hits is the tail and hind quarters, hence kidney related HLD. Your vet is unlikely to be able to do anything significant for HLD unless it is arthritis related. If so then it is worth trying metacam or another none steroidal anti-inflammatory. Start with a moderate – high end dose and see if symptoms improve, then reduce the amount given until you reach the minimum amount that gives the improvement. Over the rats life time you might expect to increase this dose gradually. It is worth noting that metacam and other none steroidal anti-inflammatories are harsh on the kidneys, so you do need to weigh up the improvement they might give against the potential bringing forward of kidney issues. Lifelong physical activity increases rats average life span (but not the maximum), more specifically if this is constant throughout the rats life it is far more beneficial than if it comes blocks, even though the rats who have constant activity will weigh roughly the same as those who have periods of activity followed by periods of rest. Comparison between continuous and intermittent physical exercise on aging rats: changes in patterns of spontaneous activity and connective tissue stability. - Skalicky M, Viidik A. Rats who are physically active throughout their lives maintain better control over their weight than those that don’t on average weighing less. Given the effect weight has on many of the biggest health impacts in our ageing rats, such as mammary tumours, heart failure, kidney degeneration, diabetes and hind leg degeneration this can have significant impact. Mentioned in most of the reports including the one quoted above and below. Regular exercise well into old age has been linked to a reduction in oxidative stress in older rats via increasing the amount of antioxidants in the body. Oxidative stress is heavily linked to degeneration and old age related illnesses such as heart problems, diabetes, cancer, and neuronal problems (including things like spinal degeneration, PT’s strokes etc). The interesting thing about this report specifically is that it looks into the effect of exercise when the rat is already old and shows obvious benefits. ), Regular Exercise: An Effective Means to Reduce Oxidative Stress in Old Rats. Annals of the New York Academy of Science -, S. Goto, Z. Radak, C. Nayakas, H. Chung,,H. Naito, R. Takahashi, H. Nakamoto. and R. Abea. This is further discussed in the following article (more recent article by the same authors) which is well worth a read as it also explains much of the mechanisms that cause ageing in more depth than I will be going to in this article. It also talks about how sudden unexpected and irregular exercise can actually cause oxidative damage (speeding up ageing) but regular steady exercise throughout life can reduce it. Regular Exercise Attenuates Oxidative Stress in Ageing Rat Tissue: A Possible Mechanism Towards Anti Ageing medicine – S. Goto, A. Radak. Ageing is defined as the gradual accumulation of damaged cells within the body. These can cause parts of the body to become less and less effective as they go on. The by-product of the failing cells can also be harmful to the body such as when a cell becomes cancerous due to oxidative damage to its DNA, or a previous safe substance becomes toxic adding strain onto the liver and kidneys (this is particularly true of protein, which tends to be easily altered by oxidation and other similar processes). Ageing is a perfectly natural process and not one we can prevent occurring. However there are numerous methods of delaying onset, or slowing down the process such as selectively breeding for late onset slow progression ageing and maximising those natural protective measures that the body puts in place such as antioxidants. Diet plays a massive part of this; however as can be seen above, an active lifestyle with plenty of exercise can have just as big an impact. At what age a rat will begin to noticeably age varies a lot depending on both its individual genetics and lifestyle up to that point. When adapting your rats lifestyle to suit old age this should be done based on how they look and act, not how many months they have been alive. Exercise increases the amount of oxygen to the muscles and so actually increases the risk of oxidation occurring (the more oxygen present the more likely it’s to happen). This should mean that exercise makes oxidation damage (and so ageing) worse. It actually does in the specific location that is being exercised, however research shows it is actually beneficial to the body as a whole unless that exercise is infrequent and involves pushing the body beyond its limits. It is thought this is achieved by stimulating the natural defences the body has to prevent this becoming an issue; in much the same way as exposure to weak or low level illnesses actually improves the body’s immune system. 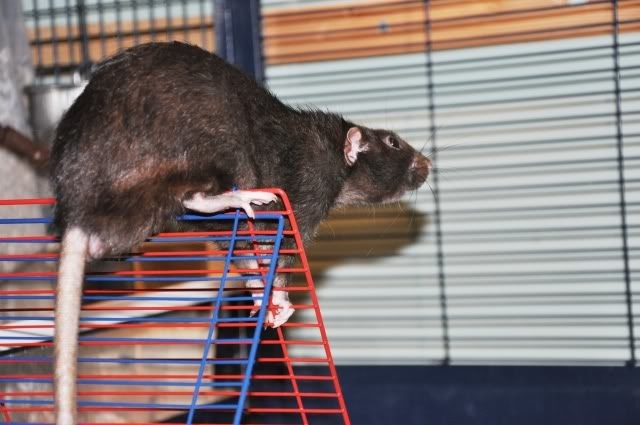 It’s also true that by actively using muscles and keeping them strong they can compensate for other weaknesses, for instance a rat with hind leg degeneration will develop very strong and well-muscled shoulders when still encouraged to climb around. They may also keep more tone in there leg muscles from trying to use them, slowing down the degeneration. Hind leg weakness in rats can be caused by a number of factors including spinal nerve degeneration (a de-myelination disease, much like multiple sclerosis), spinal degeneration (causing pressure on the nerves and eventual weakness due to nerve damage), arthritis (often identifiable by stiffness and signs of pain from motion) and kidney failure (the link is tenuous here, it may be linked with calcium deficiency which is common in rats with kidney failure or may be circumstantial as they occur at similar ages). Gentle regular exercise has been proven to help significantly with arthritis, keeping joints moving helps encourage the lubrication that all joints need to run smoothly, and some level of muscle around the joint helps hold it firmly in place. Regular use of the nerves is also widely believed to help maintain their function. If we look at some of the other common illnesses and conditions associated with old age you see that they also can really be helped by keeping your rats active. Regular exercise can help maintain a healthy weight, both by limiting excessive gain when the body is functioning well and by encouraging appetite when the body is failing and food becomes less interesting. 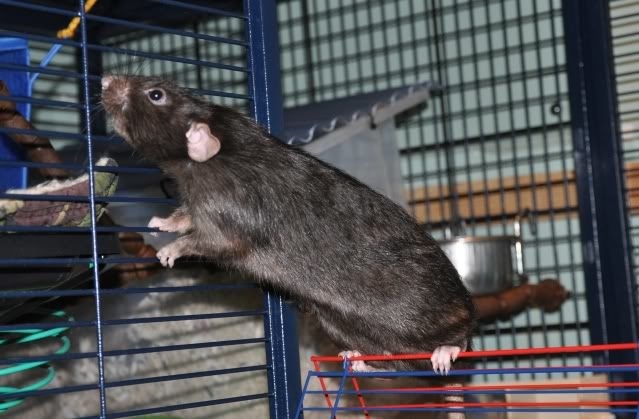 Keeping a healthy weight is essential in keeping a rat healthy and most illnesses that affect our rat are directly or indirectly affected by weight. There is also heart failure, research shows that this condition is linked to both oxidative damage and excessive weight, both of which are improved by regular exercise, the heart is also a muscle and benefits from being kept strong from regular exercise, though rats with heart conditions should be brought up to fitness slowly and not rushed. Diabetes’s is much the same, linked to the immune system (which is boosted by regular exercise), weight and oxidative damage. Mammary lumps have a strong link to weight and Pituitary tumours and other neuronal disorders such as strokes have been shown to be improved due to their strong link with oxidative damage. Kidney failure is one of the few that does not have an obvious link, however exercise a does reduce the amount of oxidised protein (and other left over damaged items) which do put an increased load on the kidneys and liver. When combined with a healthy restricted diet it can also reduce the amount of fat held around the kidneys. Scatter feeding – often there is a temptation to stop, or not start, scatter feeding for older rats, to prevent the risk of them being unable to eat enough to sustain their weight. I have personally found (both with rats used to scatter feeding and those introduced to it) that older rats actually relish the opportunity to eat. As a precaution I do occasionally offer some food in a bowl alongside scattered food (where I feel the rats are not coping well) but most of the time I have watched my old rats snub the bowl (after any favourites have been taken out) and be foraging for the scatter fed food instead. When weight starts to drop below a healthy level you can continue scatter feeding at least a good part of their food and supplement with daily or even twice daily wet meals. You can also look at your mix and aim to have larger sized constituents parts, upping the amount of flakes and human cereals over the whole grains is a good start if you feed straights. These are easier for older rats to find and hold, even if there a little unsteady. Diet – I won’t go into this section here, as it could and has had articles written about it in the past. Suffice to say a diet that is aimed at meeting the particular needs of an old rats, with supplements aimed at boosting their antioxidants, supporting kidney function and being easily digestible really can help keep them going. Wheel – old rats may still enjoy walking (or even running) in a wheel, I have found that sometimes there preference for wheel types change as they get older and my older bucks prefer a nice big wodent wheel whilst the youngsters dash madly on their silent spinner. As long as your cage has the space I would offer a wheel to your rats, you may not think they use it, however sometimes you can be surprised. I have been convinced more than once that no one in the cage used there wheel (but stubbornly refused to remove it) only to pass by the rat room late at night to witness a rat calmly running in it (before dashing back to bed and pretending they were doing nothing of the sort). Play time – as rats get older and often like there cuddles more the temptation is to spend all out of cage time snuggled up together just enjoying each other’s company. That or letting them out to free range and then watching as they settle in a fave corner and go to sleep. Even the laziest old rat can normally be encouraged to become more active if you have the time to play with them. What activity attracts them to play does vary a lot, but some of the ones I have found worked well are; chase the feather, chase the straw with air being blown through it, fetch the bit of paper for a nest (works best with girls), pea fishing, scattering a few bits of food around the free range area, explore somewhere new (change the items in there free range area, maybe throw a blanket down or a load of cardboard boxes etc., or just let them walk around the house whilst following them), even ‘chase the human’ (my lads seem to love following me around rooms or upstairs). Cage set up – don’t be tempted to retire them early and condemn them to a single story cage before they absolutely need it, even rats with relatively sever HLD can normally get around a fair bit of a well-adapted cage. You do need to take into account their needs and think through the set up a lot more but I am a firm believer in a setup which pushes the rats to do as much as there capable of, rather than one that is easy, regardless of their stage of life. When setting up a cage for older (but still able) rats you need to think what the maximum they are capable of doing. The only reliable way of getting a feel for this is to watch them move around. Do they still make an effort to sleep at the very top of the cage, or work their way as high up as possible, do they still have some use of their back legs or are they paralysed. Something like hind leg degeneration is very gradual onset and should be identifiable fairly early on. Other conditions that can limit mobility are often to do with the effort it takes to get around, again watching how they do things is a first stab. Once you have a feel for what level of ability and willingness they have then set the cage up so that it’s pushing them to their limits. Spreading the shelves out as far as you think they can climb up the bars or reach. Place several hammocks around to stop any major drops and have a deep layer of soft / springy substrate at the bottom (I love greenmile for this). Don’t be tempted to add loads of ramps, tubes and ladders yet. Then add your rats to the cage, most will immediately begin exploring (you can help this by regularly hiding a few particularly exciting bits of food around your cage after clean out), watch how far your oldies get, is there a shelf or hammock that they just can’t reach? You should let them try a few times before making adaptations as sometimes rats will surprise you with their ingenuity. Once you have an idea of how difficult or easy they find the set up then you can take bits away, or add more. At this point I find ‘leap-n-ledges’ and lava ledges are really useful, as are branches and cargo nets. I will always use these before I resort to ramps. Watch the rats get around again and make any further changes. One of the key things with oldies though is making sure what you put in place is fairly solid, as they may struggle with balance on something that moves too readily. You need to make sure you always have water, a bed and food available on the floor of the cage when they are at this stage, in case they worsen when you aren’t there and can’t climb to get it. If your rats mobility gets worse, to the point where they have no sue of their back legs (or they are so weak then it’s effectively ruled out) then some more changes can help. Using low broad ramps into more close together shelves and hammocks works well. You need to think about what the ramps are made of, I like the ferplast ramps a lot as they seem to offer enough grip, I also like to use willow garden edging (a cheap log bridge). At this stage make sure that water is available at each level and ideally a bed too. A low slung corner hammock can often help older rats groom themselves as they can prop themselves in the hammock. If you have a mixed age group this can be difficult as the set up needs to suit everyone. There are a few ways to do this, the first is to have the bottom half of the cage set up so the oldies can use it well, and the top half set up for active youngsters where the oldies can’t reach. The other I have tried is to set the cage up so that there is an easy route to all the major places (fave sleeping hammocks, water, food, top of the cage etc) and a few more challenging routes that may have particularly exciting things near them, like extra food, hammocks, wheel etc. These can also be the fastest way up and down, which will encourage the youngsters to use them, whilst giving the oldies an option too. Implementing some of these gradually should help you see more and more activity from your old rats, it should also help delay development of any existing and new conditions. Almost more importantly you get to see them growing old disgracefully, which is really a joy to watch. One rat really said this to me, a lad called Yoshi who many of you will have met as he was a regular in cuddle corner and at shows. As he grew old he refused to accept his advancing age and developing HLD, heart and kidney problems. He would attempt to keep up with the young rats at the time, scaling the full cage and attempting to make leaps some young rats couldn’t manage. He gave me many many scares with his determination to get everywhere and do everything along with his natural clumsiness and I can honestly say he truly lived every day of his life.